This week the story seemed to hot up a little bit for me, making me even more desperate to continue reading and having to try a little self control and hold back a bit. Chapter 7 brought the return of Catherine to Wuthering Heights after the dog bite kept her as a temporary invalid and convalescing at the Earnshaws. When Cathy returns she presents a more demure side to her personality. It appears that the Earnshaws have given her a lobotomy during her visit, as she is unrecognisable in her behaviour, leaving Heathcliff ashamed of his appearance and manner. I could not help but feel sorry for Heathcliff whilst reading this chapter. He had gone from being a loved member of the family to being treated no better than the farm animals. His appearance followed step by step with his feelings of depression. The following passage best describes the way he appeared to himself and others. 'His childhood's sense of superiority, instilled into him by the favours of old Mr Earnshaw, was faded away. He struggled long to keep up an equality with Catherine in her studies, and yielded wih poignant though silent regret: but he yielded completely; and here no prevailing on him to take a step in the way of moving upward, when he found he must, necessarily, sink beneath his former level. Then personal appearance sympathised with mental deterioration: he acquired a slouching gait, and ignoble look; his naturally reserved disposition was exaggerated into an almost idiotic excess of unsociable moroseness; and he took a grim pleasure, apparently, in exciting the aversion rather than the esteem of his few acquaintance. 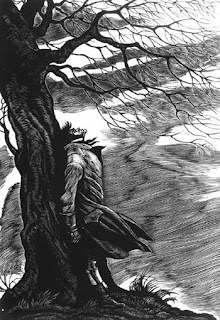 During the Christmas celebration which found Heathcliff banished, Heathcliff took an instant dislike to Earnshaw and expressed his distaste physically, causing Heathcliff to be beaten by Hindley. Poor Heathcliff! Chapter 8 finds us joyous at the birth of Hareton, who we met earlier in the book as an adult and living with Heathcliff. Unfortunately our joy is short lived when his mother dies of consumption, sending her husband Hindley to drink and disorder. He cannot cope with the loss of his wife and leaves his son in the hands of the narrator, Mrs Dean, to nurture his childhood. In this chapter we also see Catherine reveal her true colours after her stay with the Earnshaws. Catherine reveals to Edgar Earnshaw how volatile she is by hitting him. Strangely, this draws him closer to her. Some people never learn,do they? Chapter 9 brings a rather nasty incident, where Hindley returns blind drunk and begins a row with his young son, whom he decides to hold over the banisters and actually drop. Luckily for Hareton, Heathcliff was underneath to catch him and save his life, but the child is completely distraught. I can't imagine he ever loved his father after this. 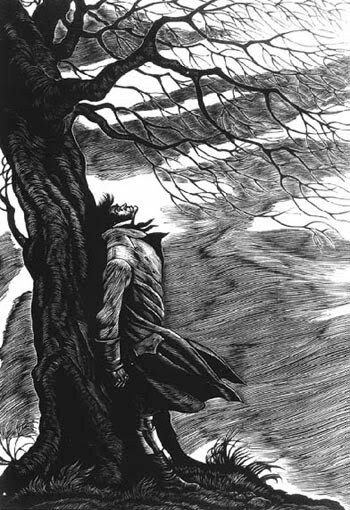 Also in this chapter, Cathy reveals to Mrs Dean that Edgar has proposed, Cathy measures her feelings for Edgar against her feelings for Heathcliff. Heathcliff misinterprets her words and thinking that Cathy does not love him, leaves Wuthering Heights at speed and does not return. I really do think that Emily Bronte should have given her characters different names. I keep getting confused with all the names beginning with 'H'. It would definitely have made the story easier to follow and the characters would have been easier to identify. I really don't like Hindley at all, especially after nearly killing his son. I am almost glad to think that Heathcliff will eventually get all Hindley's money, as he deserves to lose it after such violence and cruelty. Catherine doesn't really come across as nice either. I had hoped she would turn out better after being such a naughty child, but alas no, she has only learnt to hide her talents for nastiness, only to be revealed when the whim takes her. During Chapter 7, we see a brief return of Lockwood, but thankfully,it is brief. I still just don't like him. In fact I don't particularly like any of the characters, yet I am compelled to continue reading. Normally my dislike would make me disinterested in a book, but within this book I just can't wait to read what happens. Near the end of Chapter 9, Joseph decides to speak and I have to admit, I didn't understand a word he was saying. The language was impossible for me to decipher and I am a Brit, used to such strange dialects. I am still really enjoying this book, but I don't know how much longer I can hold out just reading three chapters a week. Aargh! I can't understand a darn thing Joseph says and it could be important stuff! I am glad that you are enjoying this book. I really like it too, it's one of my favorites. With this commentry, I feel there's no need for me to read the book, thnks for that. I meant to mention Joseph's dialect in my post, but forgot! I sure hope some major plot point isn't revealed through his speech... I'm afraid I'll miss it. It has taken tremendous self control to just read three chapter this week - can't wait to start chapter 10 tonight. Eva - I am really making light of a serious classic and I should be ashamed! Ti - I just think it is pure drivel, Joseph is not worth worrying about. Andreea - I am loving it. Petty Witter - am I giving too much detail,me thinks? Jo Ann - it is just awful. I have never read such drivel from one character before. my favorite! you are getting towards my favorite bit! i will read Joseph's stuff after a good night's sleep. but it's possible that our narrator just didn't know what he said either. It's funny isn't it how all these characters are essentially unlikeable yet you want to keep reading. I feel the same. Hindley is just evil - what an awful man. Cathy, I'm just shocked that she has two men after her with how mean she is. I'm having a hard time holding back on reading ahead too. I want to know how this is all going to pan out, especially when Heathcliff comes back. I'm struggling with Joseph, too. I feel like cringing whenever he makes an appearance. "I am almost glad to think that Heathcliff will eventually get all Hindley's money, as he deserves to lose it after such violence and cruelty." But isn't Heathcliff cruel and violent too? I think it's just changing hands from one jerk to another. But, that's what makes the story so good. Love your post! Vivienne, it sounds like you are having fun with this. Continue to enjoy! enjoy it viv, I really need to re-read this one. *sigh* you're getting to the good part! I never understood everything Joseph said too! My copy actually had footnotes that translate everything he says, so that helped. But they didn't translate his short sentences, and I couldn't even understand those! I finally started going through my Google Reader yesterday and what did I find? All of these posts about Wuthering Heights? I'm hurt that no one personally invited me! :P I'm still trying to uncover my copy (haven't organized my books since the move four months ago! ), but I'm hoping to join you guys soon. One of my editions has the woodengraving that you've pictured here--I LOVE it.